On Sunday evening, feeling like getting Mexican food, I realized I hadn’t written about a restaurant in Montclair for a while, so I went for a drive on Holt to look for a taqueria. That’s when I saw a sign for a business named Best Taco. What the heck, I pulled in. The interior was not what I expected at all: deep and wide as a tennis court, with floor-to-ceiling murals of storefronts or market stalls. 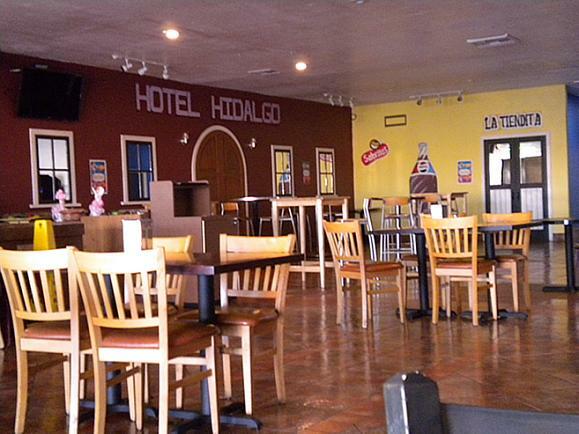 Hotel Hidalgo, one reads, complete with phony door and mirrored windows. La Tiendita, reads another, with a Coke bottle painted on the “exterior.” (Tiendita, I believe, would be a convenience store.) 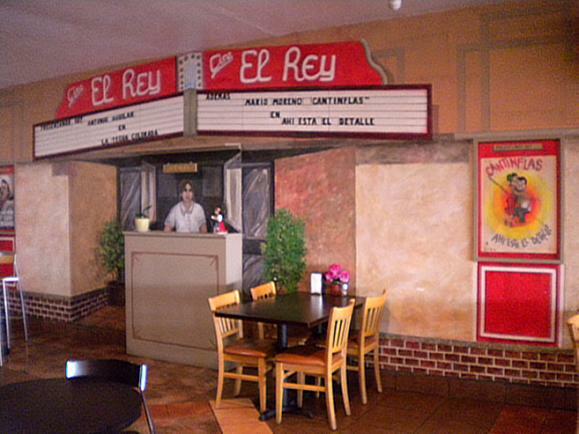 There are painted stalls representing a tortilleria and a pinata business, as well as a theater exterior mural for Cine El Rey, complete with marquee and two movie posters. This might be the most art in one place in all of Montclair. Unique. There was only one other customer in the cavernous interior. The natural light was fading and the further recesses were a bit dim, so after ordering at the counter I sat closer to the door to give me enough light to read my Heinlein paperback. The menu has tacos, burritos, huaraches, tortas, sopes, gorditas and the like. 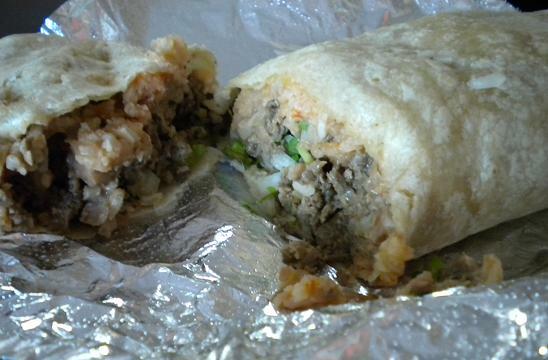 I got a carne asada burrito ($4.90). It wasn’t as meat-intensive as many places but rather balanced out with rice, refried beans and chopped onions, plus plenty of cilantro. I liked it. According to Yelp there’s another Best Taco at 10410 Ramona just above Holt, also in Montclair. 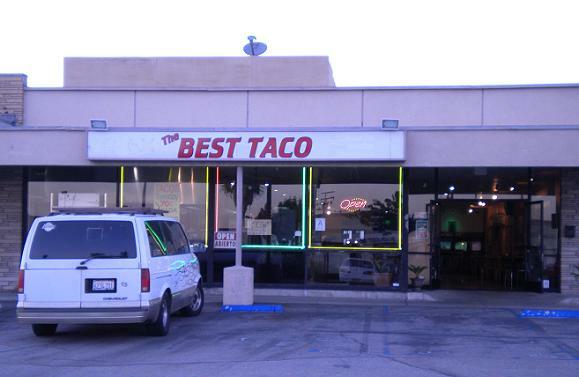 This Best Taco appears to have opened late in 2011, replacing another taqueria, Mi Mexico. The murals look new. They have a Taco Tuesday special, 70 cents each. I’m going to go out on a limb and guess that the tacos aren’t the absolute best, but the interior is certainly interesting. This entry was posted in Restaurants: Montclair by David Allen. Bookmark the permalink. Since there are no comments here, let me make one. Isn’t that a Pepsi bottle painted on that wall or were you just being generic? I would venture to say that if anybody has to call their own product/talent/establishment “the best”, then I would imagine it is not. In the sporting world, nobody calls themselves “the best” if they have one iota of common sense…other people will refer to that person as “the best” only if they truly deserve it. Plus, it’s Montclair…I rest my case.